Homer is making a liar out of me. I always tell people our CSA members get every vegetable we grow, that we don't sell the vegetables on a piece by piece basis. We pick all that is ripe and distribute that day, to our members. 3 days a week, to a total of 40 shares. And then. Our CSA members have a moment where their eyes roll back in their heads. "Hold the hot peppers" "I have 2 tons of sage in my kitchen, what in the world am I going to do with all of it?!". Never do they say this about basil. Or sweet peppers. As a kid, Homer's parents would hand all 6 of their kids...and any of the many cousins and friends hanging about...needle and thread and a couple of bushels of string beans. The kids would string them up: pierce each bean with the needle, slide down the thread until the thread was full. Hang them up until dry, eat all winter. After being pulled from the string, into a pot with water, potatoes and a smoked bit of pork. Today, their might be a federal investigation into a variety of crimes associated with these tasks: arm each child with an instrument that could poke body parts out? Make children go outdoors, pick beans and help put them by? String...thread...what dangers lie there?! Isn't the only edible vegetable one that arrives in several layers of plastic and a nice dose of chemicals to boot? Homer was remembering his days of stringing up beans. If you are on Facebook with me you might have seen his bean stringing video I posted a few weeks ago. I must admit that I could not, at first, figure out what was going on. As a kid I was allowed to handle a needle and thread, but it was never associated with food. The few extra bunches of sage and peppers got us to thinking. So this week, at the Hershey Farmers Market, we will offer these: a years worth of peppers! 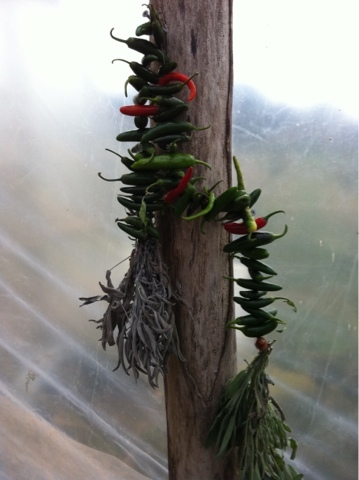 52 peppers strung on a string, with sage garlands at the ends. Homer's folks are smiling down on him, their needle and thread wielding grown up farmer.